This thanksgiving was the first time my wife Laura and I have hosted. It was also a pretty special Thanksgiving for us because it’s our daughter Talia’s first. We had 14 family members over the house in Chappaqua and it was a huge success. This year I did something a bit different. When it was time to give a toast, I took a moment for everyone at the table to really think about giving thanks and what that meant to them. I acknowledged members of our family that are no longer with us, and I then handed out hand written letters to each person at the table telling them why I’m grateful to have them in my life. This was a great way to start the dinner, and I was thrilled to see everyone really get into the holiday spirit. I hope everyone had as much fun this Thanksgiving as my family. 9. A New job! Miva Direct, Alot.com – After learning more at Azoogle than I think I can truly comprehend this early in my career (special thanks to Don Mathis, Alex Zhardanovsky, Joe Speiser and Brett Lofgren), and then experiencing on of the most intense roller coaster rides of my career at zanox, I’ve very happily landed at Miva Direct (a division of Miva Inc), and parent to our flagship brand http://www.alot.com. I’m revisiting my direct marketing roots, and I’m fired up to come into work again…priceless. 6. Techcrunch50 – the conference was broadcast live on Ustream.com. I watched every minute, and loved every minute. Some favorites – www.akoha.com, and www.fitbit.com stand out. 5. The Secret – It may be psycho-babble to some people, but the road to self help began with watching the Secret. It was a defining wake up call for a guy that was fine with being mediocre. Since viewing, I’ve become a Vice President, made more money in the past three years than the previous 5 of my career, bought a townhouse in a phenomenal town (see number 10), and started meditating. Suffice to say mediocrity is no longer on the agenda. This brilliant book has changed the way I perceive the world. If reading and seeing the Secret was the appetizer, A New Earth was the main course. I highly recommend it. The concepts are at times a bit obtuse, but it will always have you thinking. – Although it seems like an odd one, I’m hooked. I’m impressed with the athletes, and at the same time intrigued by Dana White and his business acumen. I’m a huge fan. 2. John and Kate Plus 8 – Let’s take a look at the total antithesis of Ultimate Fighting – John and Kate Plus 8. A reality show about a family that (although they already had twins), decided to try for another, and ended up with sextuplets. If you ever feel that you’re overwhelmed at work, with family etc. Watch the show, and admire the manner in which these two sleep deprived parents can communicate and parent without killing each other. A must watch for any parent. Plus the kids are adorable. This show will certainly put you in a good mood. 1. Talia Ann Dessi – Magic, just magic. From being there when she was born, to watching her notice her hands for the first time, my perfect daughter has taught me how to see the world through a whole new set of eyes, and for that I’m forever in her debt. She’s pure joy, pure light, and the best thing I’ve ever done in my life. After a lot of consideration, I finally competed in – an completed my first 10k. 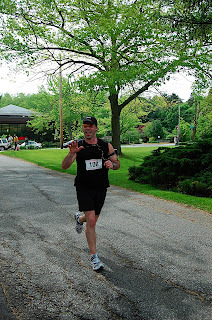 The New Castle 10k is a charity event held in my town (Chappaqua, NY). My wife, daugther and parents came out to cheer me on. It was really a great time. Afterward we met up with my brother, sister in law, and my two nieces for some brunch. Next step is a half marathon held in July. Also, I’ll be participating in a Father’s Day 5 miler in central park which should be fun as well. It’s a fund raiser for colon cancer.